Sheffield Sharks' head coach Atiba Lyons. 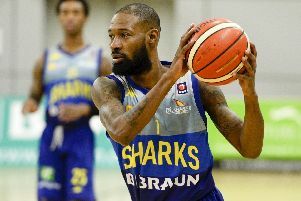 DBL Sharks Sheffield head coach Atiba Lyons has praised his players following a long-awaited win in Newcastle last weekend – but has insisted the Sharks need to be on their toes when they face Manchester Giants on Friday night. The Sharks travelled to face ESH Group Eagles Newcastle in the BBL Trophy following a run of 16 consecutive defeats in the north east – but came away with a valuable 81-76 win to set up a Trophy semi-final with Worcester Wolves. And Lyons, while full of praise for his side’s heroic efforts in coming back from as many as 17 points down against Newcastle, insists that Manchester will pose a threat when they visit the EIS. “It felt good, getting that win,” said Lyons. “We’ve fought back in a lot of games and we fought from back to front to turn them over. We played well down the stretch and came out of the Surrey game having claimed a great win. “It’s always good to start winning games at this time of year because it can easily go the other way. On the Sharks’ second-half fightback which was the catalyst for a crucial win, Lyons said: “I think the guys did a really good job. “We focused on our defence – sometimes if you have that confidence in your defence you’re not always going to shoot the ball well but it can help create offense. Despite going 17 down, what we were playing was the best-case scenario in that situation. “At half-time I just reiterated what we practice, what we train – we just weren’t executing. We played the game and we weren’t doing the sort of things we do, week-in, week-out. Lyons said the Sharks will need to keep their focus tonight against a battling Manchester side. “It’s going to be scrappy,” said Lyons.